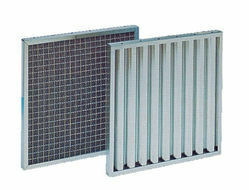 Brand: Global Airfilter India Pvt Ltd.
Industrial filter enviro tech industrial products. - Combination of flat and corrugated layers of metallic meshes of varying mesh sizes and wire diameter is used as filtration media. - Can be used as a dry filter or as oil wetted filter. - Can be used in series with a louver filter to improve life and performance. CFI All Metallic Viscous Filters are washable type filters used as pre-filters for general ventilation and air conditioning. Sheet Metal Filters offered by us are specifically customized and designed to meet the requirements of several Industries and Automotive Sector. These sheet metal filters are used to meet several components requirement like door panels, fenders, windshields, front axle within the automotive sector. We are looking for queries from Chennai and around Tamil Nadu. Metallic Filters are widely used in air conditioning, Air washer, Semiconductor etc. These Filters are make dust holding capacity in atmosphere. They are used in cooling purpose in commercial buildings. Star Purotech Filters Pvt. Ltd.
We manufacture and supply high standard Metal Filter. We are into manufacturing of metal filters, paper filters and cloth filters as per customer specification and needs. We manufacture SS, MS filters for different applications with all types of mesh. Products Price Vary from Rs 50 -500 /peice depending on the size and application of Filter .